What's the Difference between Radiesse and Juvederm? - Doctor Hermann M.D.,P.A. What’s the Difference between Radiesse and Juvederm? If you are delving into the world of dermal fillers, you will most likely be faced with the difficult task of selecting the filler that will best meet your needs. 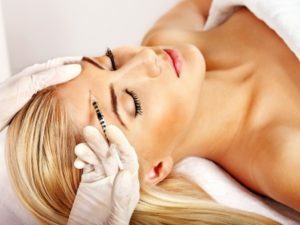 The FDA has approved a number of dermal fillers in the past few years, which provides you with an abundant yet overwhelming selection from which to choose. Radiesse and Juvederm are two of the most popular fillers because they are effective and capable of addressing numerous signs of aging on the skin. This guide will help you understand the difference so that you can select the best product for your skincare needs. Radiesse is a dermal filler that is FDA approved to last for a full 18 months. Using a Calcium Hydroxylapatite (CaHA) formula, Radiesse immediately replaces lost volume under the skin, which allows wrinkles and folds to fill and become even with the rest of the skin. This filler is also unique because it actually stimulates the body’s own production of collagen so that the skin can continue to heal itself efficiently and prevent future signs of aging. Smile lines, marionette lines, chin wrinkles, the corners of the mouth, and pre-jowls don’t stand a chance against Radiesse. Juvederm uses a different formula of hyaluronic acid to work its magic on and under the skin. The body’s natural production of hyaluronic acid decreases over time, which is one reason that the skin starts to lose its luster over the years. By injecting the skin with Juvederm’s hyaluronic acid formula, the skin receives the nourishment it needs to restore volume, youth, and radiance. Juvederm is available in many different varieties, like Juvederm Ultra XC to smooth away deep wrinkles and folds, Juvederm Voluma XC to reverse significant loss in the cheeks, and JUvederm Vollure to fill deep-set facial folds around the nose and mouth. Thanks to special Vycross technology, these fillers can be subtly molded to lift the skin and produce natural and attractive results. Whether you opt for Radiesse, Juvederm, or another one of the many fillers out there, Dr. Hermann and her team at Hermann Wellness can deliver the results that you want and make youthful skin a reality once again. Call (727) 328-2299 today to schedule your first appointment in Tampa or St. Petersburg and witness the power of one simple treatment.